Walleye pollock live to 15 years old or more. Walleye pollock (Gadus chalcogrammus) are distributed broadly in the North Pacific Ocean and eastern and western Bering Sea. In the Gulf of Alaska, pollock are considered as a single stock separate from those in the Bering Sea and Aleutian Islands. They are semidemersal (i.e., semi-bottom dwelling) distributed from near the surface to depths of 500 m. In the BSAI region, three areas are identified for pollock management purposes. These include the eastern Bering Sea shelf, the Aleutian Islands Region and the Central Bering Sea—Bogoslof Island area. In late winter/early spring pollock form huge spawning aggregations, including those found in Shelikof Strait and the eastern Bering Sea northwest of Unimak Island. Smaller aggregations in the Gulf of Alaska include those at the Shumagin Islands, the entrance to Prince William Sound, and near Middleton Island. In summer, large aggregations have been found on the east side of Kodiak Island, nearshore along the southern Alaska Peninsula, and other areas. Pollock migrate seasonally between spawning and feeding areas. They feed on copepods, euphausiids, and fish, and are preyed on by other fish, marine mammals, and seabirds. Pollock enter the fishery around age 3 and live to 15 years or more. Pollock spawn in shallow (90 to 200 m) waters of the outer continental shelf. There is also evidence that pollock spawn in oceanic areas off the continental shelf. Oceanic spawning has been reported over waters 640 m deep south of Seward, Alaska, and in the Aleutian basin. Some spawning may also occur under the sea ice. Spawning in the Bering Sea occurs at temperatures of 1 to 3°C. Temperature at time of spawning is, however, apparently not as important for the Shelikof Strait spawning population. 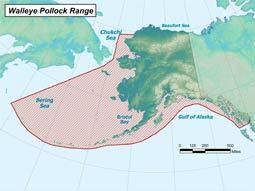 Pollock consistently return to Shelikof Strait to spawn, though the temperature varies from 3.5 to 6.5°C. In the Bering Sea, spawning begins in late February. Fish in the southeastern Bering Sea spawn first. Most spawning occurs from late March to mid June, with a peak in May. In the western Gulf of Alaska, it was found that more than 85% of pollock adults had spawned prior to their earliest sampling in May, indicating that most spawning occurred in March and April. Spawning and pre-spawning fish move high in the water column, forming dense schools. Eggs are Planktonic and are found primarily within 30 m of the surface. Pollock begin to recruit to the spawning population at age two, but age classes four and five contribute most to potential reproduction of the population. Estimates of individual female fecundity are difficult to achieve because ovaries of female pollock contain oocyte populations composed of two or three size classes. The percent of each size class released during spawning is uncertain. Pollock breed yearly. Length of incubation is dependent upon temperature. Incubation time from fertilization to 50% hatching is 10 days at 10°C but up to 27.4 days at 2°C. Newly hatched larvae are 3.5 to 4.4 mm in length and apparently float upside-down at the water surface. The yolk sac is absorbed at about 7.0 to 7.5 mm (22 days at 2°C). 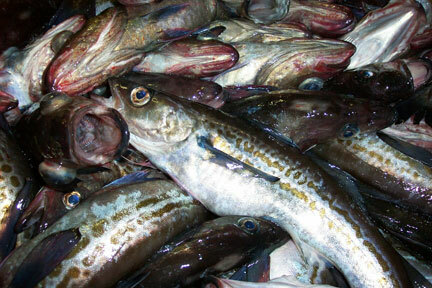 In the Bering Sea, euphausiids are the most important food for pollock under 400 mm. Fish make an important contribution to the diet of adult Bering Sea pollock, making up 70% of stomach contents by volume in a study done by the department in 1978. Pollock larvae (4.8 to 17.7 mm standard length) from the Bering Sea consume mainly copepod nauplii and eggs and adult copepods (especially Oithona similis). Copepods are, however, consumed only by small (less than 200 mm) pollock. Studies in the Bering Sea have shown that small (young of the year and one-year-old) pollock comprise at least 44% by weight of the total stomach contents of adult pollock. In the Southeastern Gulf of Alaska, it was found that small (less than 250 mm) walleye pollock ate mostly planktonic crustaceans, particularly euphausiids, mysids, and copepods, while large pollock (larger than 349 mm) generally ate larger prey, such as shrimp and fish. Cannibalism was observed in only 1% of the stomachs; however, few pollock greater than 450 mm have been examined. Pollock feed mainly in the shallow (90 to 140 m) waters of the outer continental shelf, where tidal mixing occurs in the spring. Juveniles follow a diel vertical movement, rising to feed on zooplankton near the surface at night. In the Bering Sea, pollock feeding activity is concentrated in the summer months (June - August). Pollock feed very little or not at all during the spawning period (April - mid May). In the Bering Sea, pollock follow a circular pattern of migration, moving inshore to the shallow (90 to 140 m) waters of the continental shelf to breed and feed in the spring (March), and moving to warmer, deeper areas of the shelf (160 to 300 m) in the winter months (December-February). Similar movement has also been noted In the Gulf of Alaska. Walleye pollock are schooling fish, found on or near the sea bottom as well as at mid water and near-surface depths, although most catches are found between 50 and 300 m. Juvenile (age 0) pollock in their first months of life are found above the thermocline (depth at which temperature rapidly decreases) in the Bering Sea. It’s also been observed that age 0 pollock avoid depths where water temperature is less than approximately 2.5 to 3.0°C. Age 0 pollock begin to settle to the bottom in the fall months, after which they mainly occupy semi demersal waters Concentrations of adult walleye pollock in the Bering Sea are usually found in water temperatures between 2 and 4°C. The biomass of pollock in the eastern Bering Sea is currently at a medium level relative to recent (post-1978) levels and appears to be decreasing. Pollock biomass in the Gulf of Alaska is relatively low but increasing. Populations in neither area are considered neither overfished nor approaching overfished conditions. Although localized depletion of pollock in the eastern Bering Sea may occur as a result of commercial exploitation, pollock apparently have the ability to rapidly repopulate areas where localized depletion may have occurred. In Prince William Sound, where a relatively small, state-managed fishery occurs, pollock survey biomass estimates from the biennial bottom trawl survey have declined recently, and fishery harvest levels have been reduced as a result. Recent genetic studies provided evidence suggesting that spawning aggregations in some areas in or adjacent to the Gulf of Alaska, such as Prince William Sound, may be sufficiently different to merit management as distinct stocks. Concerns about habitat degradation of the ocean bottom resulting from bottom trawling for pollock have largely been addressed by conversion of the fishery in the eastern Bering Sea to pelagic trawl gear. Similar concerns about habitat degradation in the Gulf of Alaska led to a prohibition on trawling east of 140° W longitude. Pollock is considered essential prey for Steller sea lions and management measures, such as fishery time and area closures around critical sea lion habitat, as well as reductions in seasonal proportions of pollock TAC that can be taken from critical habitat, have been implemented to mitigate possible negative impacts of pollock fisheries on Steller sea lions.